Stepping down as church treasurer led to the eviction of several large box files full of paper from my spare bedroom / home office. Inspired by a recent article in PC Pro, I looked at the freed-up space and thought … what if all the stacks of paper in my flat could be made to disappear? Keeping paper originals of most things is increasingly unnecessary in the UK, and indeed most utility companies etc. no longer send paper bills or charge extra for doing so. 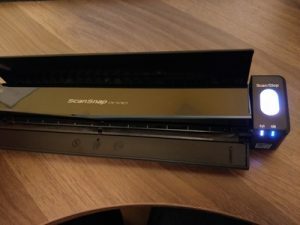 I didn’t want to spend hundreds on a fancy double-sided, sheet feeding desktop scanner (or have it occupying all the space I’d just reclaimed! ), but fortunately I was able to borrow one from work for the weekend to scan in all the old paper worth keeping. That done, the question is how best to digitise and destroy new paper as it comes in. Following the PC Pro article, I managed to find a Fujitsu ScanSnap iX100 on eBay – it was “reconditioned” but came in the original box with all the manuals and shrink wrap, so a bit of a bargain for £130. It’s tiny, battery powered, and communicates over WiFi. The killer feature on top of that is that it can scan directly into various cloud services (e.g. Dropbox) without needing to be paired with a PC or phone. So I can push incoming post etc. straight through it without having to boot up a laptop first or faff with an app. Incidentally, I thought for a few minutes that I’d bought a dud (even after charging it up for a few hours) because I couldn’t work out how to get it to power on. The answer is to open both the paper trays out (duh!). I’m properly impressed with this now it’s up and running – the OCR is very good and simply embeds the text in the PDF while leaving the original image of the page visible – so you can hit Ctrl-F and find text. I was even more impressed that, rather than simply naming files after today’s date and time, it has a reasonably good go at extracting a date from the document itself and also a file name (e.g. it manages to pick out the name of the bank when fed a bank statement). Of course, for all this to work, one has to be happy with one’s potentially quite sensitive documents being fed to a cloud service. ScanSnap Cloud keeps your scan history for two weeks. This isn’t configurable (although you can purge it manually from the app). That’s good enough for me – anything especially sensitive can be zapped as soon as it’s scanned; most things can be cleaned up automatically. Obviously the history purging doesn’t affect the copies saved to Dropbox or similar. Update: a spot of network sniffing reveals that (apart from DNS lookups) the only communicating it does is over HTTPS to a service hosted in Microsoft Azure. All pretty sensible. So at this point I have a “ScanSnap” directory in the root of my DropBox which is full of PDFs with reasonably helpful file names. Leaving them all in one big flat folder and using the DropBox search function (which does search the text inside the PDFs) might be good enough, but a bit of sorting wouldn’t go amiss. Paul Ockenden mentioned in the original article that what he really wanted was for documents to be automatically sorted into folders depending on what they were. ScanSnap isn’t quite that clever (but then again, a universally “right” answer to that problem would be pretty tricky). However, this is where a spot of scripting rounded it off for me. My DropBox folder is already synchronised onto a Linux machine, so what I wanted was a script to fire as new files came in which would spot certain patterns in the file name and move the PDF into the right place accordingly. ionotify is the Linux feature of choice for this job; a bit of experimentation confirmed that Dropbox seems to buffer incoming files somewhere temporary and then move them into the right place, so listening for IN_MOVED_TO events in the ScanSnap directory allows one to apply some simple rules based on the file name. I’ll post more on that (and the code) another time. This entry was posted in Life on November 23, 2018 by David North. Do you have Google Apps on one of your domains, left over from the days when they gave it away for free to organisations of fewer than 10 users? I do. Ever tried to tick this box and got an “We are unable to process your request at this time. Please try again later. (Error #1000)”? A search suggests that many people on “legacy” (free) Google Apps have run into this, but naturally Google aren’t going to help unless you become a paying customer. Fortunately, I stumbled across the solution: after ticking the box and before clicking Save, change one of the other settings on the page as well. I used the catch-all e-mail setting (and then changed it back later). Google are correct that the setting change above takes a few hours to propagate to all your GMail users, but it has now started working for me. This entry was posted in SysAdmin on November 15, 2018 by David North. And so, having been (joint) treasurer at St Columba’s since a few weeks after graduating in the summer of 2009, I’m finally stepping down at the end of the year. Fair question. Having a time-consuming and technical role is the perfect go-to excuse to avoid doing anything else for the church, and I had polished up the IT involved to significantly cut the hours required. Did things get better in nine years? CAF Bank’s online banking web interface sure didn’t, but at least (contrary to what some people still think) it is possible to have a system where two people authorize all outgoing payments. We already had a pleasing number of people donating by monthly standing order when I took over, but these days there are only two (soon to be one) people left who regularly send in cheques. Suppliers, visiting preachers and hirers have all got much more adept at receiving and sending payments electronically. I haven’t actually gone through with my threat to destroy all our cheque books, but the number written each year has finally dropped to match the number of fingers on less than one hand. We do still have one supplier who accepts BACS payments but “doesn’t have online banking” so continues to send us reminders by post to pay their invoices – until the end of the month when it becomes apparent that we have. Cash in the plate on Sunday has dwindled in proportion to the rise of standing orders, but still adds up to a fair bit. The level of paperwork required every 24 months to prove we’re not international money launderers continues to be a pain in the posterior for an organisation staffed by part time volunteers. One continued irritation is transferring the results of our “special collections”. The idea is simple – six times a year, we have a retiring collection for a worthy cause. We pick two charities who do work locally in Oxford, two UK-wide and two international. We claim all the Gift Aid we can on the money, and then send the balance to the charity in question. This is usually very tedious as charities large and small often don’t publish details for donations to be made via bank transfer. More often than not they do have a means to donate by card, so I can do that and claim the amount back personally – but this is messy as they insist on using details harvested this way to send you postal begging letters for years afterwards (MS Society, I’m looking at you). A particular favourite was Citizens Advice Oxford (earlier this year) who we ended up blindly posting a cheque to as they have no details on their website about how to donate. Sort of, but I’m busy enough these days that having the hours of my life back will be very,Â very nice indeed. And nine years is long enough that one is in danger of becoming a single point of failure. This entry was posted in Life on November 10, 2018 by David North. …. when he has to admit that he just doesn’t need five spare ADSL/VDSL microfilters. In the past, I never owned a bike or any of the associated kit long enough for it to wear out or for something better to come on the market – my bikes always used to get stolen when I lived in central Oxford (and skimped on locking them up properly). I’ve had a fairly nice set of CatEye lights since I got the bike in 2012. They take six AA batteries between them (four front and two back), and the speed with which they chew through them was starting to annoy me. Inevitably, they run out half way through my eight mile cycle home in the dark. 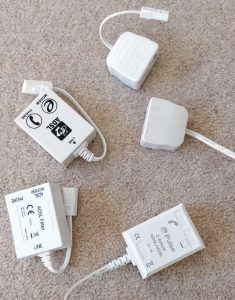 I carry a full set of spares, and they’re all rechargable, but finding somewhere safe to stop and swap can be tricky and the cold weather really seems to affect how long they can hold a charge. Getting four batteries the right way up while wearing gloves, in the dark, is also not fun. So I bought myself some new ones which charge over USB. I stuck with CatEye in the hope that they would fit on the existing brackets (they do!) and so far I’m impressed. This front light seems to punch out at least as good a cone of light on full power as its predecessor, despite being a third of the volume and half the weight. And I can charge it from the USB power brick I have in the shed, as well as from my computer at work. It also has a nice push button system for on/off which is not susceptible to the accidental activation of the sliding switch on the old one. Best of all, it has a low battery warning light, but still manages to run at full brightness until the battery is completely exhausted. My previous cycle camera gave up the ghost, and I went halves with a friend on a two-for-one offer on new ones from Chilli Technology. They took quite a while to ship, but the result is what I was hoping for: a slight evolution on the original, with weak spots like the on/off button fixed, swappable batteries and charging over micro USB. My pannier has never been the same since I put it through the washing machine after some food leaked inside it. Unfortunately the back plate ended up deforming into the shape of the edge of the washing machine drum, and so the pannier has been curved for about six years now. I replaced it with the nearest thing still made by the same manufacturer, which should do the job. One of the tricks I’ve (eventually) worked out is that if one cycles four days out of five and drives on the other one, then it makes sense to transport clean shirts and towels in by car on the fifth day to minimise the weight cycled with. This entry was posted in Life on November 8, 2018 by David North. I’m very impressed with this thing. It was recommended to me by a colleague, I found a nearly-new one on Ebay and it’s been under my passenger seat for six months. This morning, my car battery (less than a year old!) was mysteriously too flat to start it, but the booster had it going within a minute and spared us a really annoying Sunday morning delay which would have disrupted ten people. Really simple to use, and it has USB for charging phones too. That said, it did drop 60 percentage points of power after starting my Golf GTi, so I wouldn’t over-use it for other purposes. This entry was posted in Life on October 14, 2018 by David North. It didn’t come as much of a surprise to me that Crossrail will be late. And though I personally am annoyed that the day when I can jump directly from Paddington to nearly all the places I ever visit in London (most of them are in Docklands) has been pushed back, I do have one thing to say. Spare a thought for the poor sod who had to ‘fess up to the fact that it was all going to be late. I’ve been there on software projects, and it’s not fun. This entry was posted in Life on September 2, 2018 by David North. Sometimes, I wonder if it’s me getting old or large corporations failing to shut up and take my money. Or in this case, somebody else’s money. Although this is my last year “doing the money” for St Columba’s, I’m still one of an elite handful of people who “work in IT” and thus do all the geeky stuff. And our new minister moving into the manse should have been a chance to enjoy spending the church’s money on a stack of equipment (laptop, mobile phone, etc.) and sorting out an internet connection. Oh dear, sorting out an internet connection. Here we go again. The default option was Virgin Media: after all, we already have one site with them, so no need for a tedious credit check and a load of faff, just call their sales team (very efficient) and get given a date for a site survey. That gets done, though annoyingly the team they send takes about five minutes to say “we’ll need to run a duct, somebody else does that” and buzz off. They then fail totally to turn up to do the digging, blame it on “our landlords” (a likely story since we own the house outright – though it’s possible some tedious neighbour complained to the management company about digging up a shared driveway). They claimed it could be sorted, I decided I wanted it fixedÂ before I turned 40, and moved on. OK then, let’s use the BT phone line already in place. ZenÂ are a supplier I know and trust in situations like this (i.e. : not interested in switching every 18 months to get a good deal, just want good service at a reasonable and stable price). Unfortunately, entering the post code on their site results in a blank grey page. And their social media team seem completely incapable of getting that sorted. This entry was posted in SysAdmin on September 2, 2018 by David North. And so, after sixteen years, Bytemark has been bought out. In common with rather a lot of other customers (if Twitter is anything to go by), I was a bit saddened to hear about this via The Register rather than an announcement. I don’t blame the owners in the slightest – they have every right to cash in on their hard work after sixteen years. And whilst the construction of their own data centre undoubtedly gave them a cost edge over the long term, it no doubt needed to be paid for first. Unlike other customers, I’m not going to idealise the company’s previous state – my nine year happy relationship with them has been based on our dedicated server Just Working for the most part, and me never needing to contact support. On the rare occasions when I have, it’s been a mixed experience. Such as the time when my query about adding a .mx domain name to their DNS service got a keyword based response: “your MX records look OK to me”. Or even better, the occasion when they managed to e-mail me another customer’s control panel password by accident. I won’t be making any sudden moves, and if the founders are to be believed, neither will Bytemark.